Taking out up to 45 children (and some adults) on outdoor field trips in tropical weather is exactly challenge that it sounds like. Doing this for a few years, I clued in quickly enough that the information I spouted was almost less important than how I introduced it–by calming them down at on-site, then involving their five senses and curiosity as much as possible. The 2 ways I devised to achieve this were actually the same thing: I would give out a simple instruction (like “sit”), then count back backwards from 5. At sites where I needed them to pay attention to sounds/me/the quality of the air, the instruction was to “breathe in”, and then I counted them through that too. Right after the exhale, it was gratifying to see kids (of all ages!) look at each other with smiles on their faces. Some of them continue the breathing exercise on their own, and I usually give them a few more seconds before launching into my spiel while the blessed silence still reigned. Meditation is of course one of the ways to develop self-awareness, and I was more obsessed with the idea of teaching my child meditation when she was a baby than now, when she naturally likes quiet and gentle voices. I didn’t have a set plan for teaching her, it wound up all ad hoc. My child had really bad trouble falling asleep alone since 6 months of age, something that really grated on my nerves until I used that time in her room for chakra meditation while she fell asleep. It wasn’t a bad plan really, I insisted that she had to treat me as if I wasn’t there while I sat like a stone in the dark. To this day, we call it “quiet sitting”, and she now asks for us to do it together from time to time. When I do it with her, it’s all about the different kinds of breaths we can make, and visualising colours with them. When the child was able to talk (around 2), I involved her in a daily-recall ritual (recounting the day’s events in order) before bed because I thought it could help my lucid dreaming. It also involved a gratitude ritual because it was a nice way to end a day on high vibes. Now it’s a part of the day she cannot miss, and if she falls asleep before or in the middle, she can feel rather put out. Kids get the blahs from sitting around or doing the same thing too long. When the muscles need a stretch, I do CosmoForm and have devised my own way of explaining the motions to the child to make them fun for her. She likes pretending to be a seedling growing into a flower or tree and bringing the energies from the sun into her body. Exercises like “pretend you’re a rock”, “pretend you’re a ____” are already techniques taught in kids’ drama classes to get them familiar with physical expressions they can do with the entire body. Moving them slowly through a set of of different motions is much like yoga or tai chi. It’s calming, and encourages self- and body-awareness. 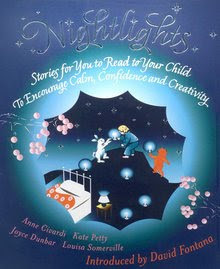 I got lucky and found a secondhand copy of “Nightlights” when the kid was 3. It’s a book with good motivations behind it, but generally the illustrations and meditations struck me as stilted. The stories inside are basically visual-meditation scripts (“you walk down the road and come upon a forest clearing” variety) and early on, the problem I saw was how little freedom the child is given in these stories. They are after all, scripts, describing the words for the meditator/protagonist to say, the actions to do, the lessons to learn. (The lessons the stories are trying to impart are good. But there’s many ways to skin a cat.) The kid herself, at 4, admitted she didn’t like the book much, so I wound up reading it through and taking its techniques and lessons and reusing them in the “magic lantern adventures” we made up ourselves before bedtime. The magic lantern motif was from the book, and while it stayed, it also became really flexible for us–we allowed ourselves to change its shape, give it/us powers to fly/breathe underwater/draw doors and get home safe. It is very much an imaginative exercise (and for the child, wish-fulfillment) that is free, free-form, and fun. The child has been attracted to acting/musicals too, and the “real or pretend?” question became useful whenever she got really good at it. It would save us a lot of confusion, and also helped us talk about theoretical situations, play situations and real situations (useful especially with regard to media). With these lines clearly drawn, I treat the kid as if I don’t expect her to lie, but I do expect her to clarify “real or pretend”, and she is always forthcoming even when not proud of her actions. I do find that young kids don’t lie if they haven’t learned how to do so–and they learn how to do so if/when situations teach them to do it to protect themselves from punishment or shame. It means adults around them need to judge less and use other means of discipline than punishment (ie. realise they are not the same thing!). I bring the real/pretend/invisible definitions into this discussion because I feel they’ve paved the way to talk about imagination and reality with children, while keeping minds open and subjects clear. I have tried to not judge imagination or reality as better than the other, but to impart the power of imagination (useful in visualisations), and I encourage the child to hone her natural sensitivity and attention to detail as well. I feel it is empowering for children (and adults) to know themselves, the subtlety of their thoughts and emotions (understood through habit or meditation), and how to imagine better while bringing those dreams they want into their reality in practical ways. And should they be/become one of those really sensitive to other people’s emotions or to unseen energies (ie. the “invisible”), those same powers of visualisation will indispensable tools for coping or protection as needed.